201812 (was CI Target 2016) - Doc / coverage publishing (private) gives an overview of the documentation flow. A Jenkins job publish-on-contint1001 is executing on contint1001.wikimedia.org to rsync the doc from the publisher instance. We would need a space in production (Ganeti VM?) to host the material with PHP7 (some docs need that see T206046). It should most probably be isolated from the rest of the network, although code published there get Code-Reviewed +2 we never know. We would need some intermediary system to have the CI building instances to push to (currently WMCS instance integration-publishing02). Jenkins (or another system) runs a task that fetch from the publisher system to doc.wikimedia.org document root. We need to find a target host on which to migrate documentation to. It would have Apache / PHP7 and run code as generated by the various code repositories that have doc/coverage enabled. WARNING: That is where the devil reside. Can a Ganeti instance be allowed to fetch from WMCS instance? That might require to add some routing and punch a hole in the firewall. Else maybe we can expose the rsync daemon on a public IP and restrict it to traffic from the Webhost Ganeti instance. T133150: Move gallium to an internal host? hashar added a subscriber: chasemp. I have updated the task with a basic overview. The doc is generated on labs instances and rsync ed to the labs instance integration-publisher. 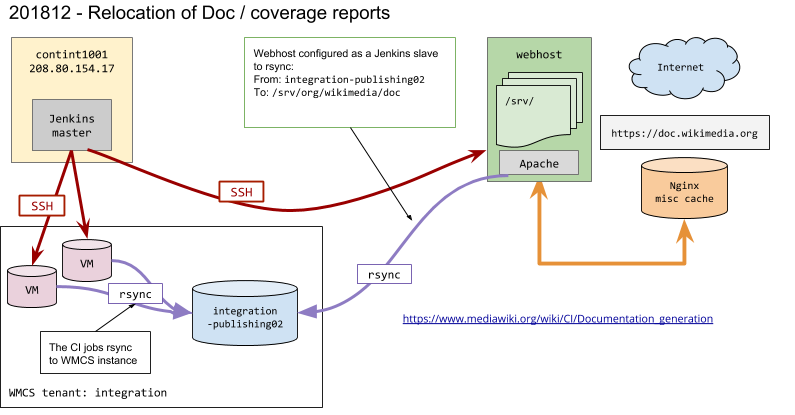 The system hosting the documentation is attached to Jenkins as a slave so that once the doc is generated, a job run to rsync the material from integration-publisher to the Apache document root /srv/org/integration/doc. Looks like the webhost system would have to be on the labs support network just like scandium so it can be accessed by Jenkins and can access the labs instance. It would need to be fairly network isolated though in case the doc has some bad code (unlikely, that should only be merged / reviewed changes). Still it is probably not a good idea to have PHP scripts running straight in the labs support hosts network. Both are running on gallium right now and we can get them to run on the gallium replacement machine. It should not block the migration. That is still worth action later on as a Technical-Debt action. Not working on it for now. It is staying on gallium/contint1001. modify the task description: add a brief summary (10-12 lines) of the problem that this proposal raises, topics discussed in the comments, and a proposed solution (if there is any yet). Remember to add a header with a title "Description," to your content. It looks to me like this is already the case. There is a header with description, it summarizes the issues and suggests a solution. There is even a diagram to go with it. @Dzahn It looks great. This is just our attempt to stay consistent with content for all the proposals and to get a brief summary that we could add on the MW page! I have updated the drawing. doc/coverage can probably be hosted on a Ganeti VM, I think that would be sufficient. The devil is into figuring out how to transfer the material from the CI slaves in WMCS to a Webhost instance in production. We so far have been using an intermediary WMCS instance (integration-publishing02) which CI build hosts can rsync to (same WMCS tenant). There is then a job on the CI master (contint1001) which has the appropriate routing/firewall rules to reach a WMCS instance. With the new Webhost being moved out of contint1001, it lose the ability to reach WMCS instances. I am lost on finding an appropriate solution. I think we can drop the integration-publishing02 proxy entirely. A publishing job would trigger a job on contint1001 and pass it the instance IP/port and the workspace. That is sufficient to initiate a rsync from contint1001. Once synced on contint1001, the job would rsync away to the new webhost on a VM. This way there are no more issues about communicating between WMCS and the webhost machine. I cant remember why we went with the publishing proxy. Maybe because I could not find a way to retrieve the instance IP/port on which the job ran. When coding Castor, I have been using the Parameterized Trigger Plugin (trigger-builds in JJB) which does pass SSH_CONNECTION which is the instance/port. That let us reach the instance directly. Seems we would need a Ganeti VM and then refactor the way publishing is handled in the Jenkins jobs. The doc.wikimedia.org would also need to be migrated (rsync current data, change DNS etc). hashar added a subtask: T211974: eqiad: 1 VM request for doc.wikimedia.org. [operations/puppet@production] doc: remove "deprecated user of DefaultType"
The repository will then be deployed at /srv/deployment/integration/docroot. 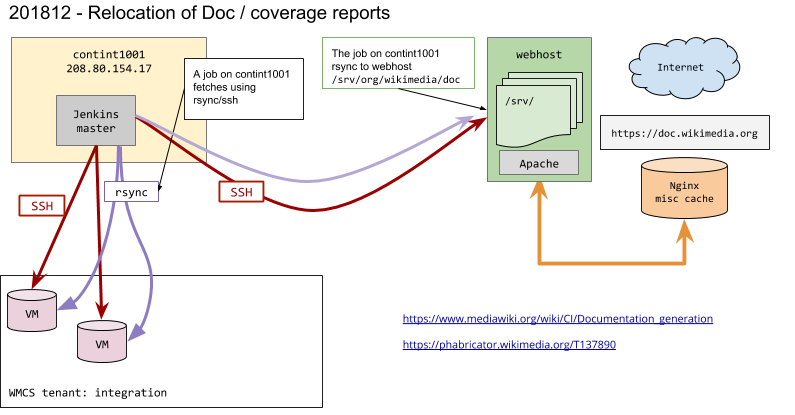 So probably we will want to update Apache Document root to point to it and have rsyncd to expose the org/wikimedia/org relatively to that (instead of /srv/). Will do with a simple git::clone and manual pull. that easier to handle. All publish jobs now also trigger publish-to-doc1001 job. It seems good so far and I think I caught all potential issues it might have. I will monitor it until next year. switch doc.wikimedia.org backend in varnish to doc1001. Ditto for coverage report, for labs-tools-heritage the target directory has coverage under ./coverage. I have missed normalizing the source path to always include /.. I will keep doing verifications to make sure content is properly published. Will clean them when we get sudo access on the host. In short: we can change the backend in Varnish. https://doc.wikimedia.org/ is now served by doc1001.eqiad.wmnet and working as expected. This one is resolved. There are a few pending changes but nothing any interesting or urgent for the service. I ended up skipping integration-publisher02 and I have deleted it.